Another Sunday, another gourmet Sunday. This morning started off with an amazing breakfast. Only yesterday I had picked up a pack of frozen shrimp from Godrej Nature's Basket. And since Sunday is not the day to have the normal tasteless breakfast I was thinking of various options when I woke up this morning. Then I remembered Kylie Kwong making a shrimp omelette in one of her shows. Out came the shrimp from my vault, or my freezer. I sauteed the thawed shrimp with finely chopped onion. After the shrimp curled up and turned translucent golden, into the pan went the beaten egg with generous helpings of black olives, Spanish paprika, chopped green chillies, pepper melange, oregano and various other herbs. The aroma of the sauteing shrimp was awesome. The hardest part is turning over a heavy omelette. So I chose to fold it this time. The shrimp omelette went very well with golden crisp toast and ketchup. My only regret - I forgot to put Marmite on my toast! If breakfasts can be great, why can't dinners be good? 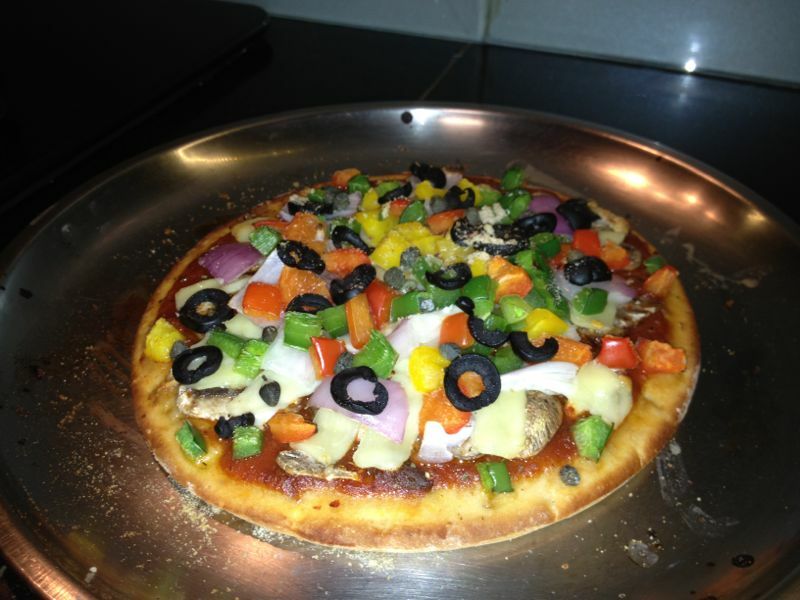 So, instead of ordering a calorie accelerator Dominos pizza, we made our own pizza tonight. On a whole wheat base, a teaspoon of olive oil was spread on top of which went generous amounts of spicy and tangy sauce. Then went sliced mushrooms, assorted peppers and diced onions. A limited amount of cheese was added followed chopped olives and capers! And it did taste good. Dominos watch out, you're going to loose business here! Hi Rajeev. My name is Cassandra and write a blog called Lapis & Llamas. I really enjoy your blog and that is why I nominated you for a Versatile Blogger Award.